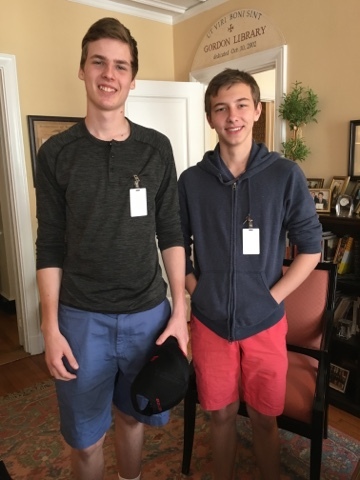 Ra'ad '15 and Vladimir '14 dropped by my office to chat. They had a long weekend away from school at Groton. Seeing them both again so happy and confident made my day. Today I visited Blair Academy and Lawrenceville with Mr. Imbelli to catch up with alums. We have three at Blair and two at Lawrenceville with one from each graduating. Jack '12 is off to West Point and Henry '12 is off to Brown. They are both very excited about their next chapters. 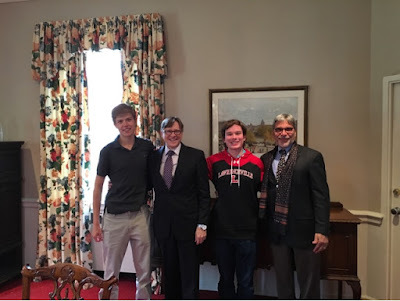 It was great fun spending time with Tim '14 and Henry '12 at Blair. It was a really special surprise to catch up with Pierce '15 who left Saint David's in the 2nd grade for Hong Kong. 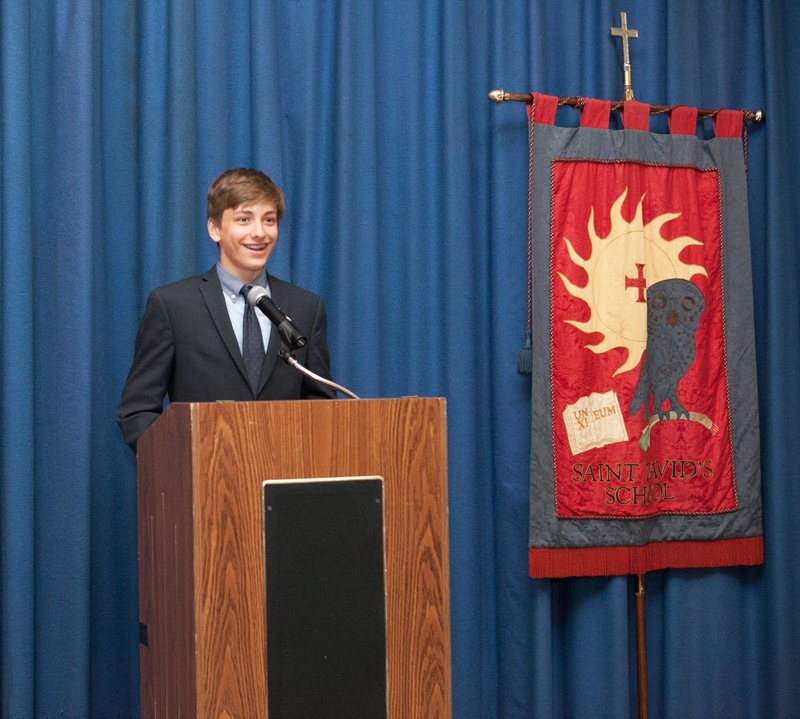 He loved his time at Saint David's and spoke of how much he treasured his early foundation and memories. 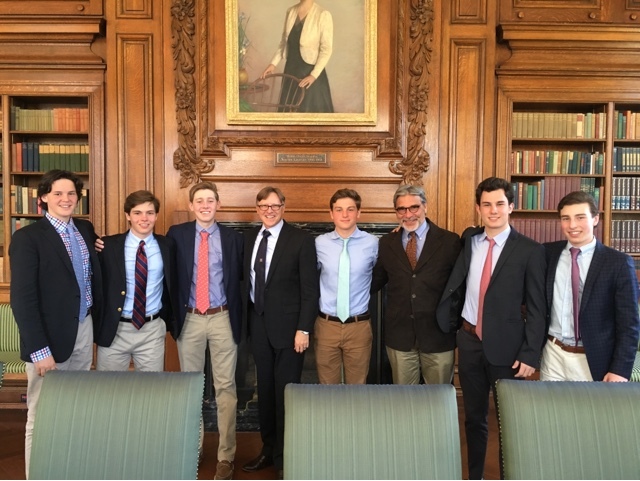 At Lawrenceville Jack '12 and Fabrizio '15 hosted us for a fabulous lunch and discussion in the senior hall. I'm very proud of what our alums are doing at their respective schools. They are leading, learning and giving to their communities. From the crowds at all lunch periods and dismissal times today it was apparent that few could resist rice crispy treats shaped like dog bones, or vanilla and chocolate cupcakes sporting Oreo puppy ears or, for that matter, any of the delectable treats that took up house in Saint David's Lobby this afternoon. It was the Fourth Grade's annual Pennies for Puppies Bake Sale, a long-term tradition that engages our boys in all facets of running a fundraiser, from planning to marketing, to baking and selling. First graders also participate by helping make posters advertising the sale. Proceeds will benefit The Seeing Eye, an organization that trains guide dogs, and the boys will visit their facility in Morristown, New Jersey, to deliver their check. Doing good for others through expenditure of time and effort is something we encourage at Saint David's. Our boys embrace these projects with energy and excitement. On Monday and Tuesday, 18 teachers participated in a series of workshops with Mark Church, our learning consultant from Harvard, and co-author of Making Thinking Visible. 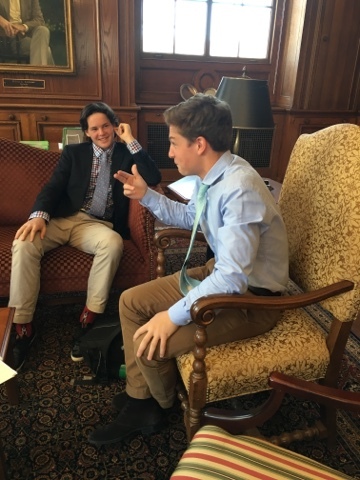 As part of our school's reflection on this year's theme, Deliberate Moral Introspection, the sessions focused on “How do we frame the story of thinking and learning at Saint David’s?" Mark shared the Understanding Map, which was developed by Harvard Project Zero. The map identifies a number of high leverage thinking moves that people use to solve problems. These thinking dispositions are representative of the types of thinking that lead to deeper understanding. For instance, when studying history, Considering Different Viewpoints and Reasoning with Evidence are certainly essential. In math, when solving an algebraic equation, Making Connections and Uncovering Complexity are key moves to consider. Teachers can use the Understanding Map as a planning tool to determine the “thinking agenda” for their units of study. The 18 teachers in the seed group routinely meet throughout the school year to discuss teaching and learning, and examine ways they can make thinking more visible in their classrooms. These professional learning teams stimulate and fuel our teachers’ practice, creating a rich culture of thinking for our teachers and boys. Our youngest musicians in the First Orchestra, led by Mrs. Francis, and our older boys of the Philharmonic Ensemble, conducted by Mr. Hough, performed in a special concert for the Lower School boys this morning. First Orchestra played "Ode to Joy" and "This Land Is Your Land," while the Philharmonic performed "Dance of the Tumblers" from Snow Maiden and the theme from Star Wars. 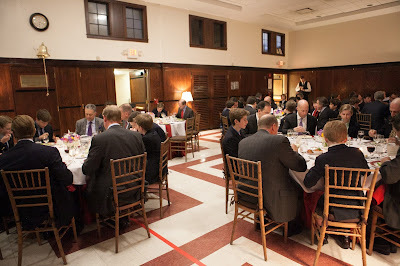 Lower School boys also learned about the different instruments in both orchestras, and the First Orchestra members provided spoken introductions to their pieces. They did a terrific job! We all enjoyed beginning the day with music courtesy of our boys. In preparation for a new school partnership with the Guggenheim for our seventh and eighth grade observational drawing classes, faculty members Jenna Boccella, Nancy Iannicelli and Melanie Fidler recently attended a drawing workshop at the museum. 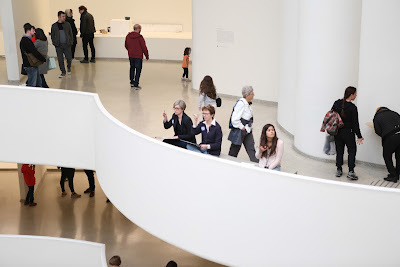 Led by the Guggenheim's Director of Education, Sharon Vatsky, the workshop included a slide presentation on the history of the museum, followed by a tour from an architectural perspective focusing on the use of geometric and organic forms in both the the interior and exterior of the building, and how the museum's design is based on the modernist idea that “form follows function." Participants then drew from the vantage point of their choice. Beginning in the fall, our school's exciting new collaboration with our neighbor down the street will include several sessions of our boys' drawing onsite at the Guggenheim, and culminate with an exhibit of their work in a museum gallery. Art Department Chair Jenna Boccella and art teacher Mark Sunderwirth will finalize the new program over the summer. This is a wonderful addition to our robust art program and another meaningful educational partnership between Saint David's School and a major global cultural institution. Our first graders are official cartographers, having learned all about mapping through our partnership with the N-Y Historical Society! 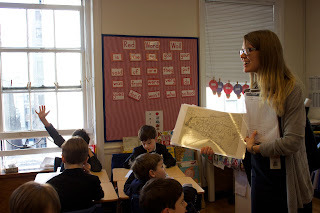 Over a series of weeks in March and April, an educator from the N-Y Historical Society joined Saint David's classroom teachers to lead the boys through a comprehensive hands-on study of maps. 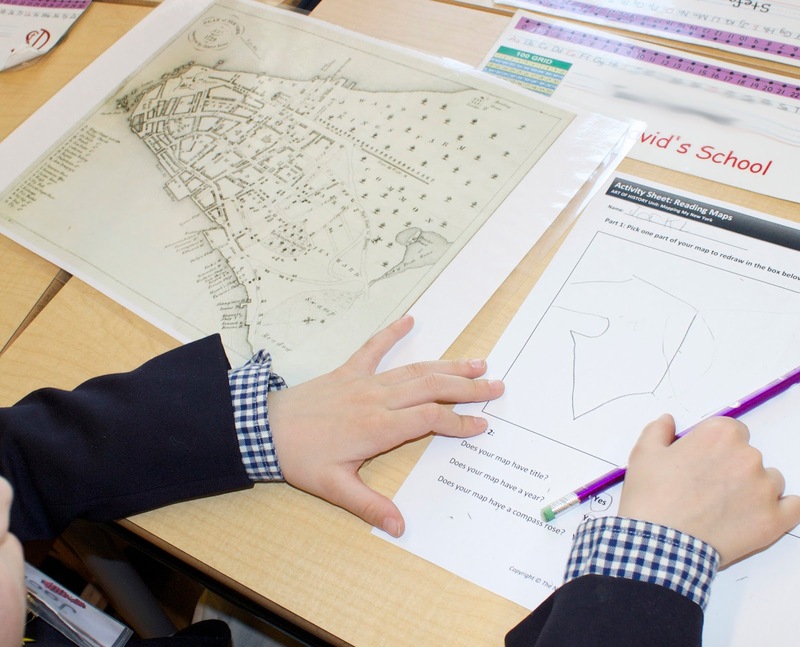 Boys examined historical maps of New York from the N-YHS collection, noting how the city has changed over time, and they learned about a map's essential components: compass, scale, map key, and color. They then set about creating their own maps of the neighborhood around Saint David's on the Upper East Side, incorporating stamp symbols they conceptualized designed, and printed, to mark the location of places of interest. 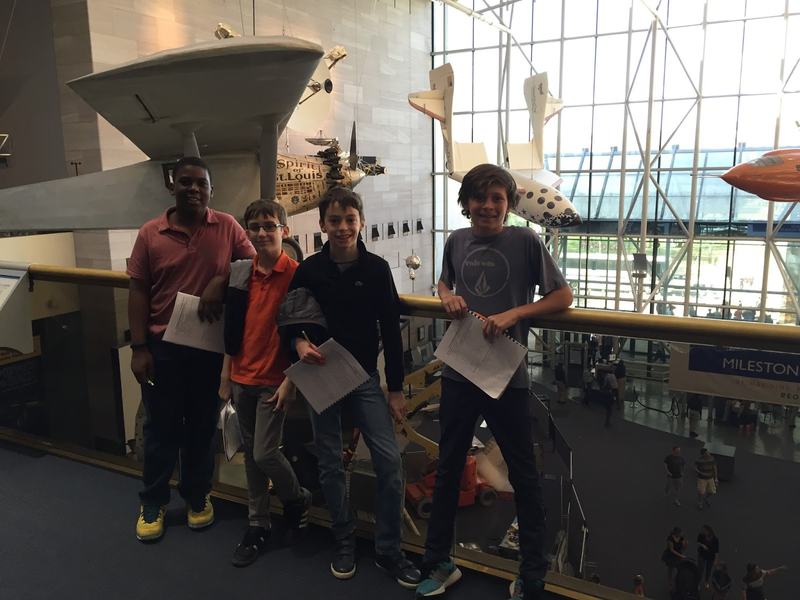 The exercise required the boys to think analytically and critically as they planned their maps. The result? A collection of colorful and accurate maps, and a group of proud young cartographers with enhanced understanding of how maps "work." This is the second year of our collaboration with N-YHS for the First Grade "Mapping My New York" unit. 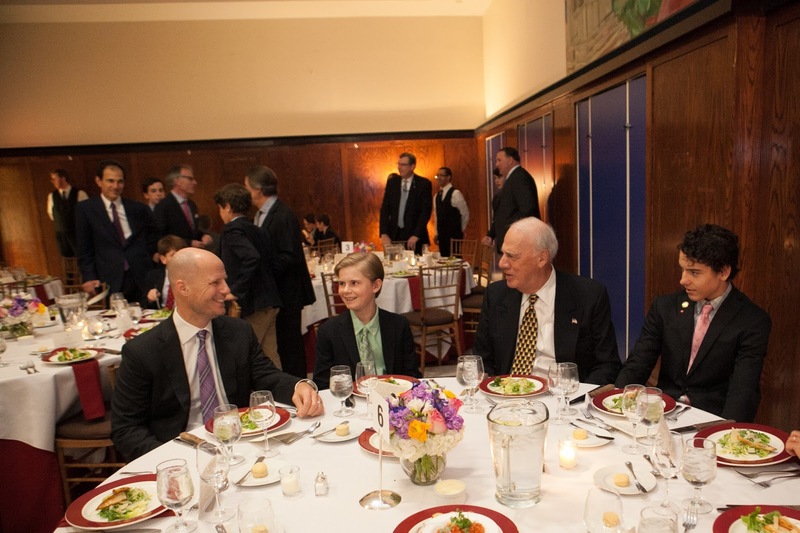 It is an example of several partnerships between Saint David's and a variety of premier historical, cultural, and scientific institutions that extend learning through exposure to great collections and experts. Matt Phelan, award-winning author or illustrator of several books for young readers, including Marilyn's Monsters, Flora's Very Windy Day, and the Scott O'Dell Award-winning graphic novel The Storm in the Barn, visited Saint David's last week to discuss the process of writing and illustrating books with boys in first through sixth grades. 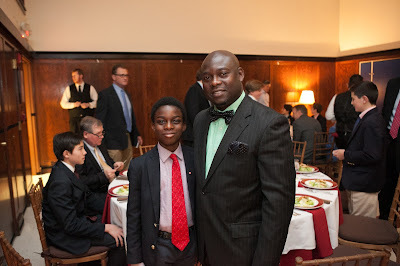 He gave our boys the inside scoop on the many steps involved in a book's journey from conception to completion. Mr. Phelan noted that he draws so many more illustrations than appear in the final book, as a way to record his ideas and determine how characters will look or dress. He also stressed the editing process and the fact that final illustrations are often the result of several iterations, telling the boys, "Every time you draw a picture, it gives you a chance to make your idea better." Boys were surprised to learn that the cover illustration is the last thing he creates, done "at the end of the process, when I really know the book." The boys listened carefully and asked Mr. Phelan thoughtful questions at the end of his presentation. 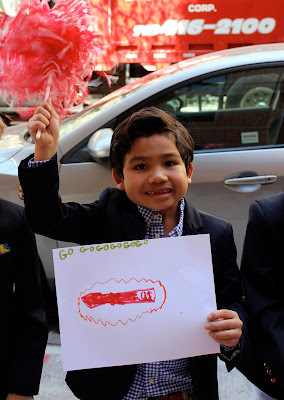 From their very early days in Kindergarten at Saint David's, our boys are writers and illustrators of their own picture books, which they read to their fellow classmates. This wonderful opportunity for them to learn from and interact with a renowned author/illustrator is made possible through our Parents Association Author Series program. Our sixth graders met with Senator John McCain in DC. The Senator cited the Spanish Civil War and For Whom The Bell Tolls as his inspiration of how to live his life and his motivation for joining the military. He participated in a question and answer session with the boys that covered a variety of issues including the lack of bipartisanship, illegal immigration, and ISIS. He also provided his views on the current presidential election. The boys return to New York today after a whirlwind tour of the nation's capital, her monuments, branches of government, and many of her most significant players! This is education in the world for the world. The 6th grade met with Senator Gillibrand of New York, their senator, this afternoon at the Capitol, and took the opportunity for a photo op. The sixth graders met with Senate Majority Leader Mitch McConnell on the steps of our nation's Capitol, where the Senator engaged the boys in a question and answer session on topics ranging from Trump to high capacity magazines and his support for the coal industry. The session followed the boys' earlier meeting with Speaker Paul Ryan, who stressed the importance of compromise and listening to those who disagree with you: "Know that you can benefit from other people's views." This is a great message for our boys to hear, which dovetails with our yearlong theme of Deliberate Moral Introspection, as that practice requires the ability to listen to different points of view and to analyze issues from a variety of perspectives. What a remarkable experience our boys are having these days as they interact with leaders in the House and Senate, and visit the sites of DC! Saint David's Sixth Grade boys are in the nation's Capitol at the nation's capital with Paul Ryan, Speaker of the House. After a thorough study of the foundation of the Republic and its form of government, the boys are now experiencing much of it first hand and in person! "Sometime in the midst of all this, we became friends. And his story, and all its vast world passed into mine." --From the Introduction of Blood & Oil by Roxane Farmanfarmaian. 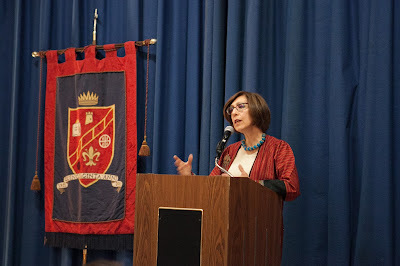 "Stories are so important; they become traditions that tell about the good that often comes out of bad experiences..." So began Roxane Farmanfarmaian's fascinating talk Monday night at Saint David's Seventh Grade Father-Son Dinner. 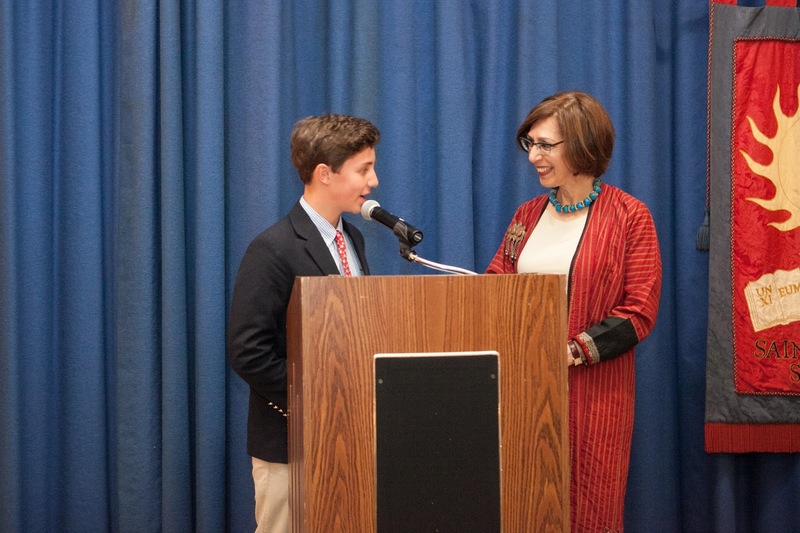 Dr. Farmanfarmaian, Affiliated Lecturer of Modern Middle East Studies at the Political and International Studies Department at Cambridge University, was introduced by her nephew, Saint David's seventh grader Cyrus '17. She spoke to the seventh grade boys and their fathers about what makes a "Good Man" through the prism of her book Blood & Oil: A Prince's Memoir of Iran from the Shah to the Ayatollah (Random House 2005), which she co-authored with her late father, Prince Manucher Farmanfarmaian. The memoir is a collection of tales told by her father about his and his father's trials, tribulations, and triumph as they lived through turbulent times in Iran, including periods of exile and return to their native country. Prince Manucher Farmanfarmaian was director of an Iranian oil company and one of the founders of OPEC, and served as the Shah's oil adviser. When the Revolution of 1979 hit, he had to leave everything behind--his home, all of his possessions. Despite this adversity, Dr. Farmanfarmaian observed that her father remained always "the perennial optimist." "My father had learned grit, imagination and, most critically, faith in humanity" which, she said, led him to be a good man. "He stuck with his principles and core values, beliefs." So that when he returned home and began a potato chip factory, "He was very happy; he lived simply, stayed optimistic." In reflecting upon the evening's theme of A Good Man, Dr. Farmanfarmaian noted, "My father's optimism, his belief in humanity, and ability to face adversity with grace and deliberate moral introspection, are what I would say made him a good man." 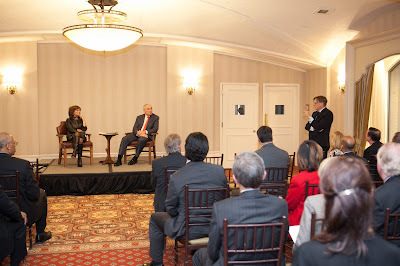 Following her talk, Dr. Farmanfarmaian took questions from the boys and fathers in attendance. The queries were thoughtful and related to the current situation in the Middle East. Dr. Farmanfarmaian's responses were thought provoking and reflective of the complex social-politcal-economic forces at play; and a call for deliberate moral introspection. 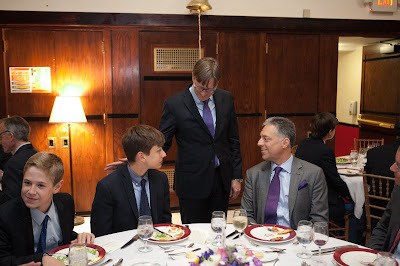 It was a wonderful talk and dinner. Boys and their dads left the event with a copy of Blood & Oil signed by the author, and much to discuss on the way home. 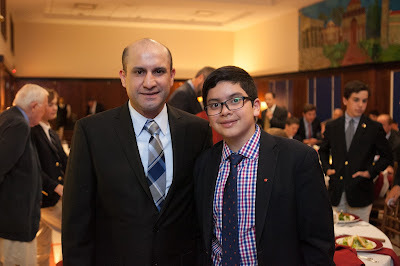 Our deep appreciation to Dr. Farmanfarmaian and the Farman-Farmaian family at Saint David's for enabling us to experience such a special evening that celebrates the bond between father and son. 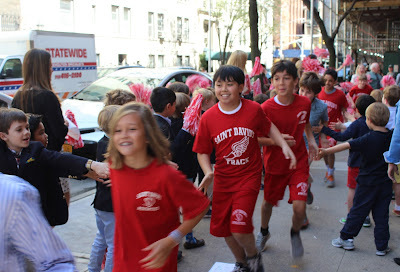 Cheered on by our pre-primary grade boys, today our fifth and sixth graders kicked off this year's Central Park walk-a-thon series of fundraisers for the Saint David's Kalina School in Ethiopia. 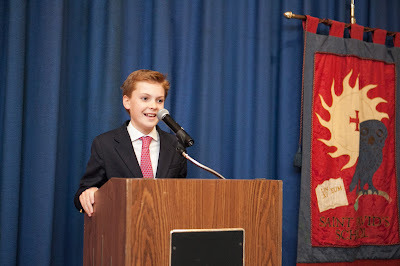 Tomorrow, Grade Four will have theirs, followed by the seventh and eighth graders in May. The Saint David's Kalina School officially opened in Tigray, Ethiopia, in June 2014, a result of fundraising done by the entire student body, led by the Eighth Grade, over three years. The site now features four elementary classrooms, an administrative block, and an early childhood center. 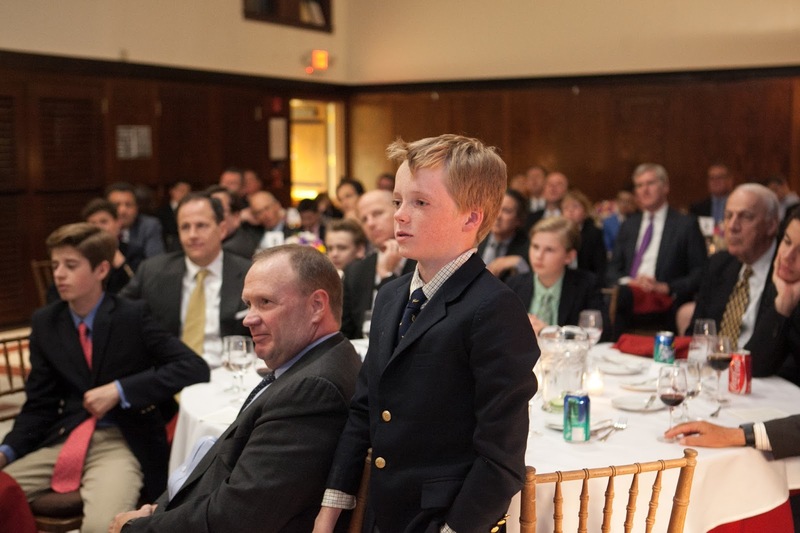 This year, boys are raising money for an additional middle school facility. The Ethiopia School project began during our 60th anniversary year as a way for our boys to give back for the greater good. It continues today with the enthusiastic committed participation of our boys. On one of the first nice spring days of the new season, I trekked north deep into Massachusetts to visit alums at Deerfield Academy. The boys look and sound great. Felix (not pictured) is graduating and heading off to UPenn, Uno (absent) is a junior, Giacomo and Pierson (absent) are too, Michael and Joni are sophomores, and Federico, Max and Ethan are all freshmen. 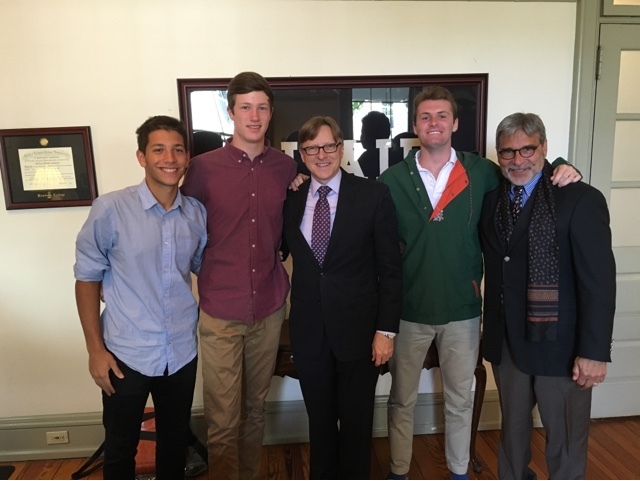 The boys were particularly proud of the fact that four generations of Saint David's boys made the JV soccer team--Federico '15, Michael '14, Giacomo '13, and Felix '12. They are flying the Red Banner high, up there in central Massachusetts. I'd like to share some great examples of "math made visual" this week at Saint David's. In Grade Three, boys are working in teams to create a "Geometry City." Each city must meet various qualifications established by the teacher, and incorporate polygons, angles, lines, and lines of symmetry. Meanwhile our fourth graders, learning how to add and subtract fractions with like and unlike denominators, are collaborating in pairs or groups of three to design representations of various tasks using colorful square manipulatives. Finally, our sixth graders, employing what they've just learned in their Digital Universe astronomy unit about the properties of various planets, are teaming up to design 3-D Space Colonies. The boys must include prisms or cylinders, fit their design into a cube measuring 10 cm on a side, calculate the area and volume of each structure, and write a description of the colony including details about its location, function, and living spaces. This project will culminate when they print out their colonies using a 3-D printer. When our boys visualize math in projects such as these, they are able to actually see if their solutions are correct or need adjustments. This is a powerful way to increase understanding of underlying concepts, and is illustrative of Saint David's program-wide focus on making thinking visible. Our eighth graders are well into their DNA study unit through Saint David's partnership with the DNA Learning Center at Cold Spring Harbor Laboratory. Yesterday, Mrs. Lee of the DNALC was at Saint David's, leading the boys in a lab on DNA isolation. They used pipetters, highly precise tools that measure and transfer tiny quantities of liquids, and learned how to load and run a small centrifuge, and about Polymerase Chain Reaction (PCR)--the method used to amplify DNA segments. In the coming weeks, the boys will work in groups on a DNA research topic of their choice, posing a question that can be answered through DNA barcoding. Second graders visited the Picasso galleries at MoMA on Wednesday as part of a new interdisciplinary unit on the artist, designed by art teacher Melanie Fidler and Spanish teachers Maria Valdes and Elizabeth Whitman. While at MoMA the boys viewed several Picasso and Cubist works, sketched a Futurist sculpture Unique Forms of Continuity in Space, by Umberto Boccioni and participated in a collage activity with various shapes of construction paper, inspired by the Three Musicians. The teachers report that the visit was wonderful and the museum educators were impressed with the boys' knowledge of Picasso and his Cubist period. The boys have learned about Picasso's life, and details about Spain and Spanish culture in their Spanish immersion classes, which have included sessions on the characteristics of each of the artist's periods of work: Red, Blue, and his most important, Cubism. In art they are now applying the characteristics and techniques of Cubism to create their own collagraph prints. 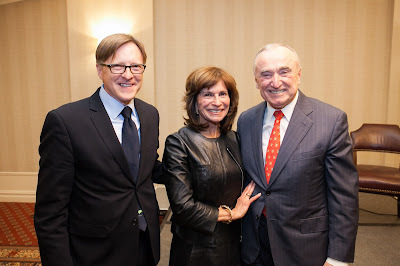 On Tuesday evening, all of us who attended the Saint David's Networking Event--and it was a packed house--were treated to a custom version of "Law and Order," a fascinating presentation by New York City Police Commissioner William J. Bratton and his wife--Attorney, Author, and Legal Analyst/Television Commentator Rikki Klieman. 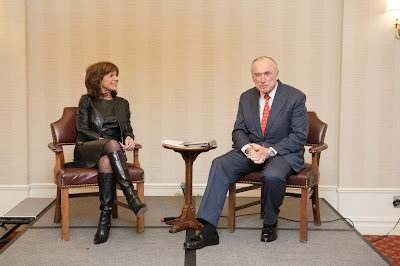 Commissioner Bratton spoke about how policing has changed over the past 25 years, moving toward a model that emphasizes the importance of community policing, addresses rather than ignores disorder, and focuses on prevention. He was clear on the biggest challenges of the 21st century: "Now we have to deal not only with disorder and crime, but with terrorism and technology; it is a constant battle to stay ahead of the advances in technology." The Commissioner noted that vigilance on the part of all people is required, that there is a "shared responsibility" for public safety. Ms. Klieman asked us to ponder the role of the media in shaping the news, and to think about which news outlets we visit and why. Do we only go to those that reinforce our positions, or do we also check those with opposing points of view, or those that are more objective? 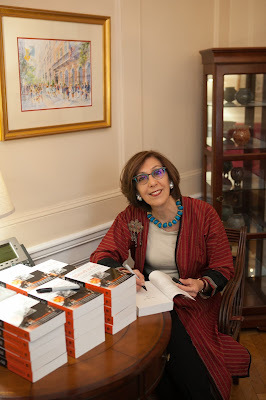 She discussed the changes wrought first by the advent of cable, then through the internet and social media, which have led to news being indistinguishable from editorializing, a far cry from the standard of truly fair and balanced journalism. Today, said Ms. Klieman, "the media is no longer telling you what to think about, it is telling you what to think." 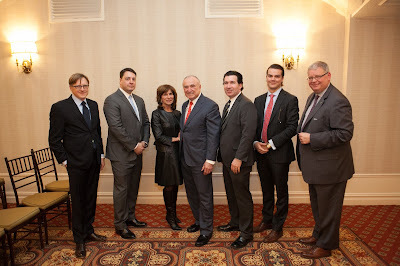 Toward the end of the program, I asked Ms. Klieman and Commissioner Bratton what habits of mind our young alumni should be cultivating if they are interested in pursuing law enforcement or criminal justice careers. Our speakers pointed to a shift away from the "warrior" or "action" focused mindset to "thinkers with skills at deescalating situations, adept with technology" and possessing abilities not normally associated with law enforcement. The importance of deep thinking and reflection, something that is a strong focus at Saint David's, was reinforced in their discussion. It was an enlightening, informative evening and the school deeply appreciates Commissioner Bratton and Ms. Klieman for taking the time to speak to our community. 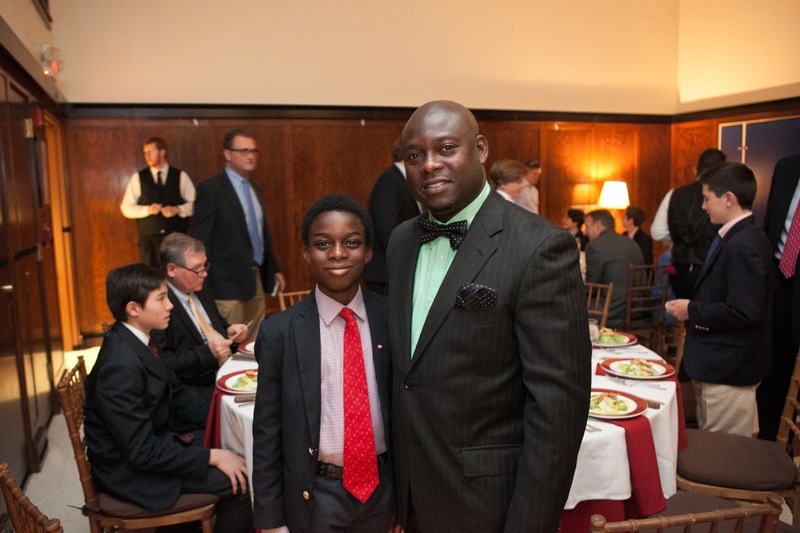 Thanks too, to our Alumni Council Chair Sam Samuels '84 for organizing yet another wonderful installment of our annual Networking Event and to Gene Whyte '74. Photo with Saint David's alumni who are on the police force.